You’ve heard Taylor guitars, whether or not you realize it. An American guitar brand founded in the 1970s, they are played by such artists as Dave Matthews, Tony Iommi, Jason Mraz, and—appropriately—Taylor Swift. Taylor guitars are praised for their playability and brilliant sound quality, and while some purists dislike their use of technology, there’s no arguing that the company is one of the world’s most innovative guitar manufacturers. 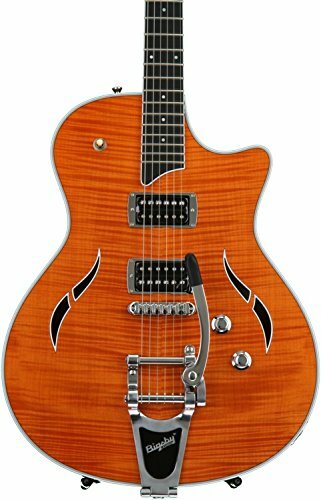 Initially specializing only in acoustic guitars, the company added their T5 line of hollowbody and semi-hollowbody hybrid electric guitars in 2005, further increasing their versatility to a modern player. As with most musical instruments, Taylor guitars can run anywhere from a few hundred to several thousand dollars. 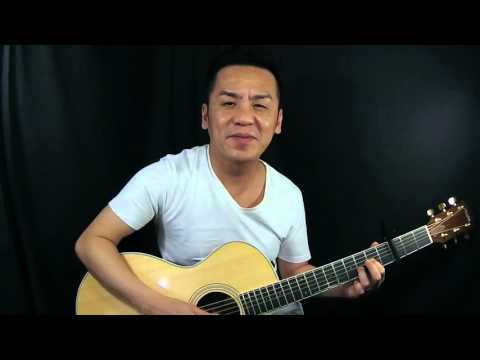 While the choice of a specific musical instrument is a very personal decision based on what sound you want and your needs as a musician, the ones listed below are some of the 4 best Taylor guitars for the money. In the world of Taylor guitars, this is considered entry-level, but it’s honestly the top of what an entry-level guitar can be. The Grand Auditorium shape is a proprietary Taylor design component, with proportions falling between the iconic Dreadnought shape and a Grand Concert. It’s one of the most popular shapes in the acoustic line due to its versatility—responsive enough for fingerstyle players with enough power for pickers and strummers. The layered satele back and sides are resilient and durable, while the solid spruce top gives it a wide dynamic range and lends a brightness and clarity to the sound. 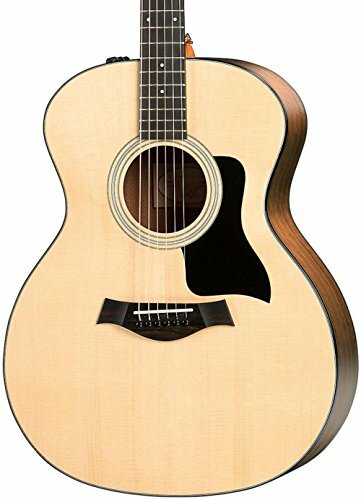 Arguably the best Taylor acoustic guitar you can find in this price range, it is a true workhorse, able to withstand the wear and tear of daily playing and gigging. This is without doubt one of best Taylor guitars for the money. The same versatile Grand Auditorium shape as the 114e above, the 414ce has the added benefit of including a Venetian cutaway to allow easier access to the upper frets. Also like the 114e, the top is of sitka spruce. Where the 414ce really differentiates itself is in the ovangkol used in constructing the back and sides. A sustainable African tonewood, this relative of rosewood was introduced by Taylor in the early 2000s. Ovangkol has a fuller sound in the mid- and upper-range than rosewood, with bright trebles similar to guitars built of koa. Between the ovangkol body and the ebony fingerboard, the 414ce has a warmer tone than most Taylor models, without losing the distinctive Taylor sound. The Dreadnought is the most traditional of guitar shapes, ideal for flatpickers and strummers for its powerful tone, rich lows, and crisp highs. The 310ce from Taylor is a slight variant on their classic 310 Dreadnought, featuring a cutaway as well as built-in Expression System pickups so it’s performance-ready straight out of the box. 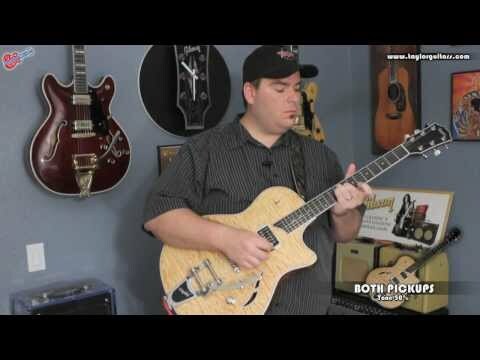 The excellent projection of this guitar makes it perfect for folk and bluegrass players but it has the versatility to work in rock or jazz styles, as well. The Sitka spruce soundboard has a bright response and a broad dynamic range, while the sapele sides round out the tone, giving it depth that’s especially audible in the low end. This is among the best Taylor acoustic guitars period. If the electric guitar is more your speed, you can’t go wrong with a Taylor T3. 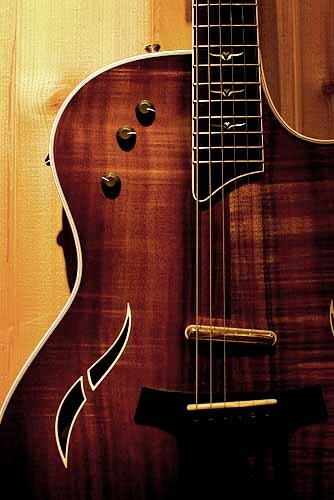 Taylor Guitars added a hollowbody electric to their product line in 2005; the T3 is an adaptation of this design, incorporating elements of the classic semi-hollowbody and the SolidBody design. The electronics of this model include full-size Vintage Alnico humbuckers and a coil-splitting application that makes the tone control circuit more useful than it is on other guitars, giving players more control over the warmth of their tone. The Bigsby vibrato tailpiece is paired with a metal roller bridge that allows for quality vibrato without adding pitch issues. 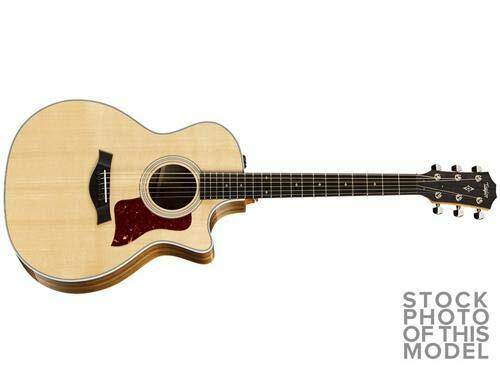 If electric products are your thing, this should be on your list of the best Taylor guitars. 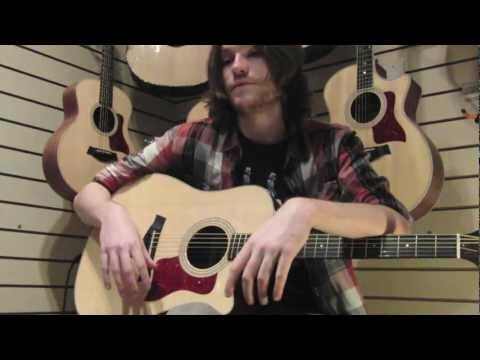 What Makes Taylor Guitars so Special? The Taylor Guitar brand is known for its distinctive sound quality—bright and brilliant, with a crisp clarity to the upper register that other guitar brands can be hard-pressed to achieve. 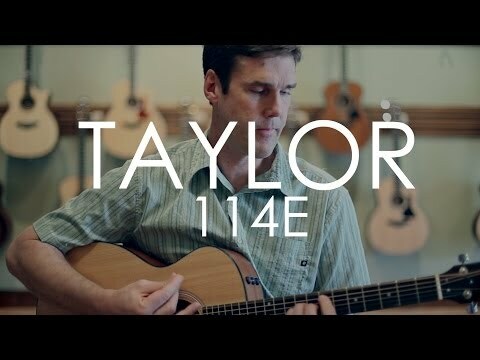 The consistency of this tonal quality across the brand’s many models and designs is perhaps the most impressive aspect of Taylor’s construction process. Playability is also a huge plus for those who enjoy Taylor guitars. They are easy to play “out of the box,” so to speak—from the action to the saddle to the angle of the neck, everything about a Taylor Guitar is designed to be easy for the musician playing it. This is arguably one of the best selling points of the brand. The electronics, though a secondary consideration for most consumers, are also worth a mention when describing what sets Taylor apart from the rest. All Taylor Guitars also come outfitted with their proprietary Expression System. This system combines a state of the art pickup with a professional quality preamp and specialized sensing technology that creates a network of surface-sensing magnetic microphones across the entire soundboard. Sensors mounted in the top of the guitar and underneath the fretboard measure string vibrations, combining seamlessly to provide the player complete control over their instrument’s amplification. Given the relatively low dynamic range of the completely acoustic guitar, amplification is necessary in most performance applications—and the quality of the wood and craftsmanship only matter so much if what the audience hears through the amp is distorted. These kinds of innovations are standard for Taylor Guitars, which has been leading the way in instrument design since its inception in the 1970s. Their New Technology (NT) necks—while somewhat divisive in the guitar world—allow for incredible precision and consistency in neck angle and can be micro-adjusted, meaning it can be serviced without compromising stability. The Grand Auditorium, Grand Concert, and Grand Symphony body designs were all pioneered by Taylor, and provide a welcome change from the Dreadnought body shape that is the industry default. Taylor Guitars is also a forward-thinking company, striving for sustainability in the harvest of their tonewoods. The company’s efforts in this regard haven’t gone unrecognized; in 2014, Taylor Guitars received an Award for Corporate Excellence from the State Department for their sensitive use of ebony, setting up their own mill in Cameroon to ensure the prized fretboard material is ethically and safely harvested. While details like this don’t directly affect the guitar’s sound, they do go to show the care and attention Taylor Guitars pays to every step of the construction process—the details that make their instruments well worth the investment. The best Taylor guitar for the money in the end just might be any Taylor guitar.